You didn’t really think it was over yet, did you? 😉 I couldn’t let you off the hook that easily. In case you’re just joining us, this is all going to seem remarkably out of context, so I would advise you to go back first here, then here, and finally here to figure out what the heck I’m talking about. Or, if all you care about is ice cream, read on! Cakes without something creamy, fluffy, saucy or frosty always look a bit naked, don’t they? Even when they’re full of tasty things like lavender, orange and almond. But here’s the tricky thing: with these strong flavors already vying for your attention, whatever goes with them has to complement, rather than compete. I suppose a dollop of whipped cream, or even the perennial favorite greek yogurt would have done the job… but I don’t know, that all seems so ordinary. And really, I’m a sucker for ice cream. Ice cream is fantastic, because in addition to being one of the universe’s all-time greatest hits, it always sparks intense admiration from guests, as if it were a feat of culinary alchemy to make. Nothing could actually be further from the truth. Most of the time I start with a custard base when I make ice cream. While not strictly necessary, I love the rich eggy smoothness it gives. On the other hand, it’s a bit fussy as you have to walk the fine line between curdled eggs and salmonella risk (the latter of which I admittedly don’t take too many precautions against). It also takes a long time, because you have to start by heating ingredients, and so before you can get them iced a long cooling period has to follow. The magic of this ice cream, then, is that neither does it contain eggs nor does it need to be cooked, but it is nonetheless incredibly rich and smooth, and the whole thing can be shoved in the freezer within ten minutes of removing the ingredients from the fridge. "And what if I don’t have an ice cream maker?" you ask. Well, you don’t need one. In fact, I don’t have one either – well technically I do but it’s in storage in Germany – and that doesn’t stop me. The only thing that you have to do if you make ice cream without a machine is take the semifrozen mixture out of the freezer at regular intervals and stir it vigorously (or use a hand beater if you prefer) to break down the ice crystals. Granted, it’s not quite as creamy as the churned kind, but it sure beats no ice cream. The recipe, once again, comes from The Book*, but I actually deviated quite a bit. The original uses just ricotta, sugar, milk and cream. I suppose if you have really, really top quality sheep’s milk ricotta that simple mixture would be flavorful enough, but my local Tesco ricotta doesn’t really cut the mustard in that sense. If you have a source for it, by all means eliminate the bells and whistles. If, like me, your ricotta is somewhat less illustrious, I would highly recommend the addition of a bit more flavor like in the following recipe. One more thing – I do find that British supermarket ricotta is a cut above the American stuff sold in large plastic containers with pseudo-Italian names. If you’re in the US, use it at your own risk. If you have any other soft unripened cheese at your disposal, however, whether it be a high quality farmer’s cheese, cream cheese, even goat cheese – I would probably use that instead. Hmmm, goats cheese ice cream, any takers? *See previous posts, if you really don’t know! Hi Melissa! I was happy to see your very informative comment on squid ink used in Basque cookery. Thanks so much! Now it only spurs me to try out more recipes using squid ink. To tell the truth, I personally cannot really taste anything particular in the dough although my husband says he can. I think perhaps it was so much of a disgusting thing when I had to gut squids as a kid.Another thing…how cool that you posted about ricotta icecream! Julie of A Finger in Every Pie just asked if I had a recipe…I’m going to send her your link subito! Ok.. it’s 8:09 in the morning here in Kelowna & I’ve already had breakfast but that picture looks so incredibly delish – I could eat it now.Gorgeous!! Mmmmm.. you might be on to something there! Come to think of it, I did used to eat ice cream for b’fast when I worked overnights at NBC. I would walk home at 8:30 in the morning through Central Park and stop at my corner bodega for a tub of Ben & Jerry’s. I would eat it, go for a skate through the park and then turn in for the “night.” Nuts! Melissa -How do you think this might work with creme fraiche? It’s definitely thinner than ricotta – would you reduce the milk or cream? Thinking of making it for company this week. Thanks! Hi Teri, that does sound good – should be nice and tangy with creme fraiche. I don’t know how well it would turn out without making a custard base, though, since the cheese helps to emulsify the mixture in place of eggs. I think maybe substituting evaporated milk for the normal milk would do the trick, since it doesn’t get so icy when it freezes. Have you checked on epicurious? They have a recipe for creme fraiche ice cream and several for sour cream ice cream, so that might help you decide on the proper technique. Good luck and let me know how it turns out! This looks so good! 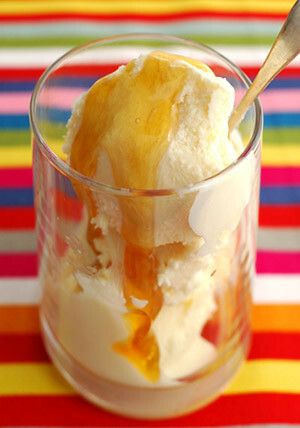 I am a big ricotta (& mascarpone) fan…and I can only imagine that ricotta & honey ice cream can only taste delicious! I made this with homemade ricotta. It was delicious!